Chocho-Chan, Cara, Francie and Deluxe Quick Curl Barbie. The Quick Curl dolls are very fragile. Their hair is almost impossible to restore and their arms and legs fall off very easily. 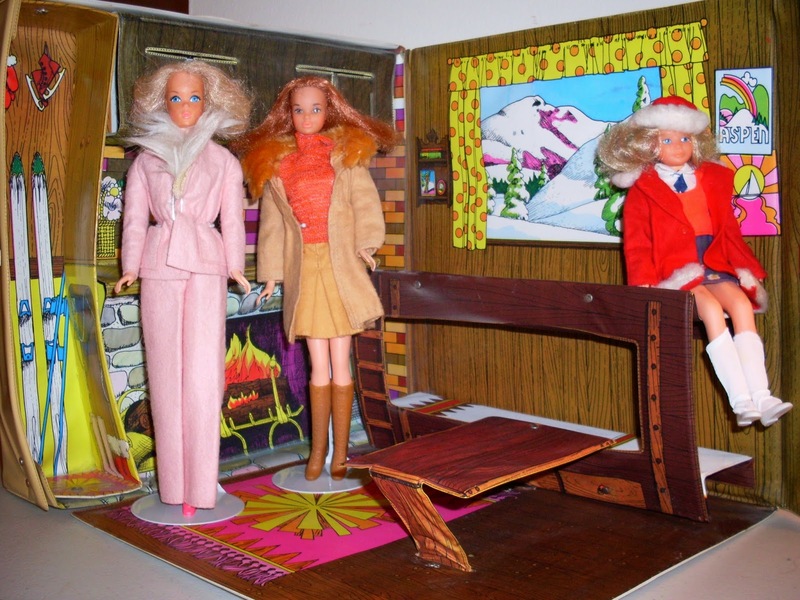 They are often cited as the earliest example of Mattel's cheapening of its products in the 1970s. These flaws and this attitude are a shame because the dolls are really pretty when in mint condition, out of the box, and redressed. Other related items were the Quick Curl Barbie Boutique doll case in 1973, the Whitman Quick Curl Barbie, Francie, Kelley and Skipper paper dolls in a folder in 1974 and the Whitman Quick Curl Barbie boxed paper doll in 1976. The 1980s Golden Dream Barbie and Christie dolls, who also had the wired hair, and related items were sold beginning in 1981, but this column is not about them. 1. There were two separate clothing booklets in 1973. The first one is called The Beautiful World of Barbie and has only the Mattel sunburst logo on its back. It features the following from 1972: Hair Originals, the Busy dolls, the Talking Busy dolls, the Malibus including PJ, the Country Camper, the Campout Tent, the Garden Patio, six of the Barbie Best Buys, six Francie Best Buys, four Skipper Best Buys, shoes for all of the dolls, mod cases including the Travel Trunk, and Skipper's Swing-a-Rounder Gym. 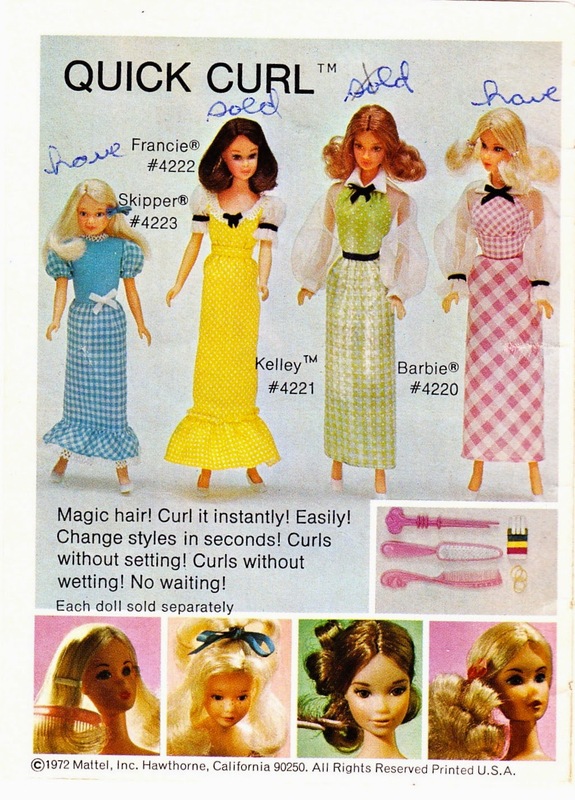 And from 1973: The first four Quick Curls, Mod Hair Ken, Barbie's Beauty Center (the styling head with the retractable ponytail), 12 new Barbie Best Buys, four new Ken Best Buys, six new Ken Best Buys and four new Ken Best Buys. 2. The second booklet is called The World of Barbie and includes all of the aforementioned items from 1973 and has the Barbie Vanity Case on the back. Quick Curl Miss America, new Hair Originals, the Friend Ship, the Goin' Campin' set, Country Living Home, Surprise House, the new Get Up N Go outfits, the 1973 Best Buys only, Sew Magic, Sew Magic Deluxe Set and Sew Magic Add-ons are pictured. 3. The first booklet shows stock numbers, the second has none listed at all. The first booklet was the only one that included photos of how to style Quick Curl hair. This booklet is much harder to find than the 1973 exclusive one, and that is probably why you seldom read about how to style the dolls' hair. 4. The hairstyles could be mounds of curls, the late 1960s flip, or the new style with feathers along the sides. It's best to style the hair with the included two-prong curler. It is much easier to use than regular or Barbie curlers, a pencil or your fingers! to come to the door to let them in the Mountain Ski Cabin. 5. You will see the dolls' flaws in my photos. One doll's leg is always longer than the other (yes, I know humans are that way but dolls usually don't have this trait.) The limbs either freeze in place or they fall off. Usually it's the legs but my Kelley has a re-attachable right arm. The hair eventually turns into an uncombable tangle at the ends. Also, my Kelley has no wires in her hair! I don't know if all of the Kelleys had only a few wires, or if the condition is only in mine! 6. To keep the arms from falling off of the Deluxe Quick Curl dolls, Mattel cleverly designed a solution. The dresses were designed to be off-the-shoulder, and the girls came with shawls wrapped around them. These aren't just supposed to be stylish, but also practical to hold the arms in place! 7. The felt decals on Tuli's and Chocho's gowns fall off after the glue dries out over the decades. They always need to be reattached. By the way, "Tuli" means "tulip" and "Chocho" means "butterfly" in Japanese. 8. I've wondered over the years if Chocho was the inspiration for Carrie Fisher's Princess Leia or if Francie was the inspiration for Roxann Dawson's B'elanna Torres. the Mountain Ski Cabin, while Skipper tries out the bunk beds. and Skipper, #8613 Winter Day and #8611 School Starts. 9. 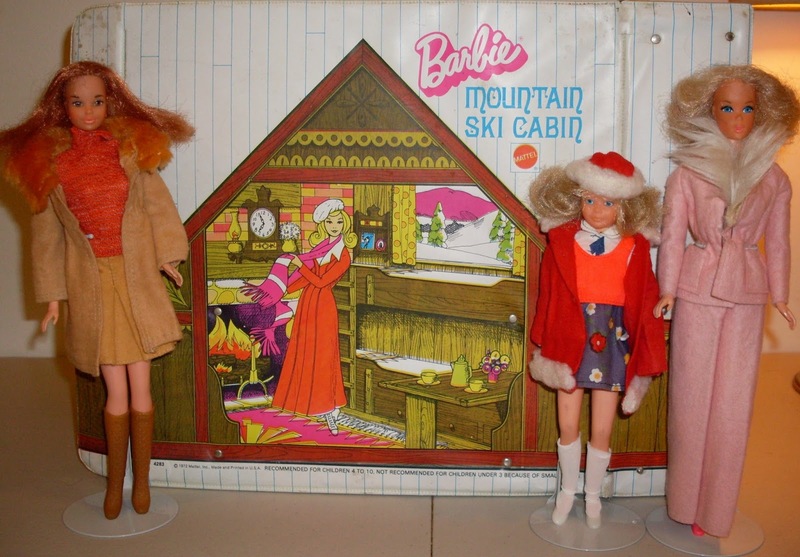 Last but not least, I am showing you some photos of three dolls with a different 1973 accessory, Barbie's Mountain Ski Cabin. One thing I discovered when redressing my dolls is that the winter coats from that year look really good on the dolls. Huge fake fur collars had gotten really popular by that time, which is why Mattel featured them. ** But I also have to wonder if Mattel designed the coats to work with and set off the Quick Curl hair, because they seem to go together well. **The 1973 outfits with fur collars were: Barbie #8682 New Fashion Coat, Barbie #8687 Pantsuit with Fur, Francie Best Buy #8646 and Skipper #8613 Winter Day. The Mountain Ski Cabin case has an unusual message on front: "Recommended for children 4 to 10. Not recommended for children under 3 because of small parts." We've all seen the warning about "children under 3" but this is the only time I've ever read the sentence about ages 4 to 10. The picture isn't Barbie; it's a blonde Twist N Turn Francie wearing her #1769 Long on Leather, both from 1970. 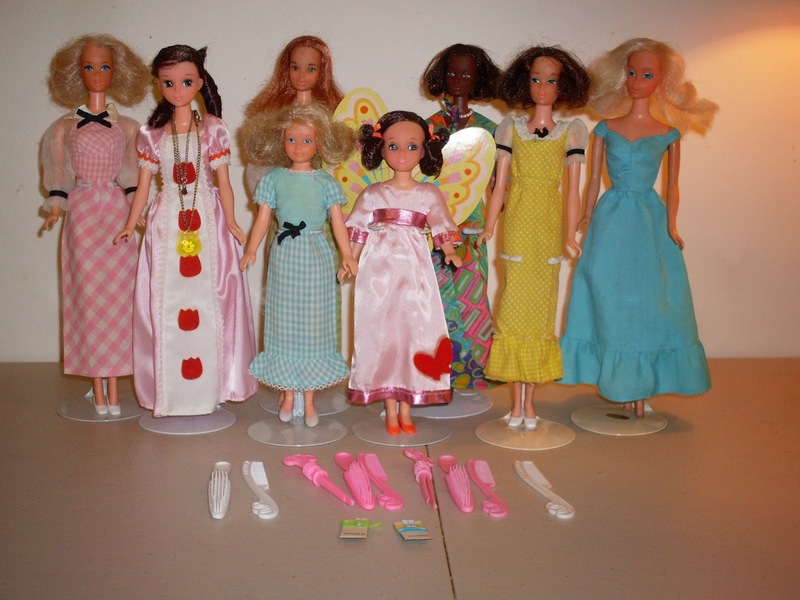 I have seen photos over the years of matching outfits that Mattel made for its Chatty Cathy and Barbie dolls. But did Mattel also give the dolls matching hair? 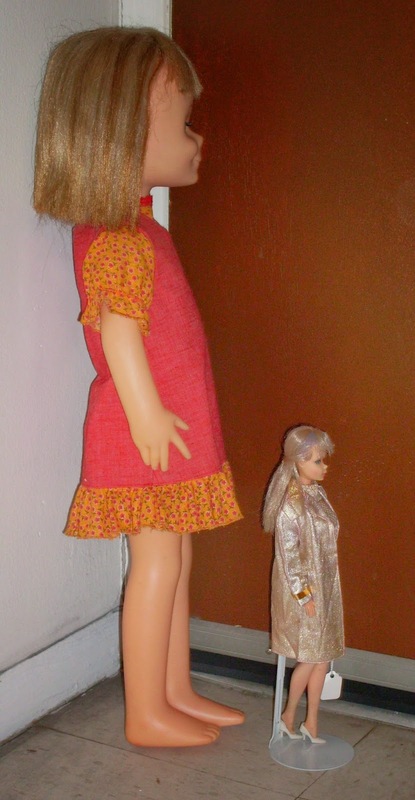 You've seen my previous pictures of my 1967 Twist N Turn Barbie doll and my Charmin' Chatty. But now I've put the two dolls next to each other, because I realized the other week that their hair is very much alike. This particular TNT Barbie has a hair color called Summer Sand. She's not actually blonde--her hair is streaked with glittery gold and silver. Cathy has the same hair. But this is what puzzles me. I've read that Charmin' Chatty was sold in 1963 and 1964, but this Barbie wasn't on the market until 1967. Was this version of Cathy actually still being manufactured and sold in 1967, which is why she and Barbie ended up with the same strands of hair? Or did Mattel have a lot of Charmin' Chatty frosted hair left over, and used it on their early TNT dolls?